1 of 5 Heat grill to medium-high. Slice pineapple into 8 rings; pour juice from container into a measuring cup. Add enough pineapple or orange juice to equal 1/3 cup. Set aside. 2 of 5 Season beef on all sides with 1/2 tsp of the salt. Coat pineapple and sweet pepper pieces with nonstick cooking spray and season with 1/4 tsp of the salt. 3 of 5 In a small saucepan, whisk together pineapple juice, 1/4 cup water, the brown sugar, olive oil, ginger, cornstarch, crushed red pepper, remaining 1/4 tsp salt and the black pepper. Bring to a boil over high heat; simmer 1 minute. 4 of 5 Add fillets and pineapple slices to grill, then cover. Grill 3 minutes; uncover, turn over and grill another 3 minutes or until desired doneness. 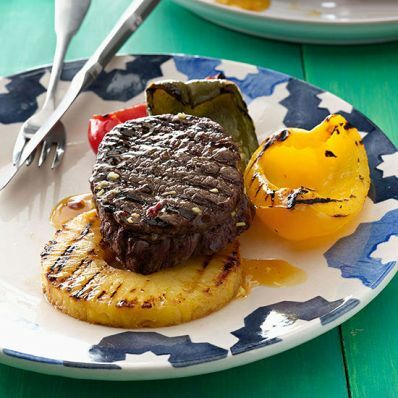 Let beef and pineapple rest 5 minutes. Meanwhile, grill peppers, covered, 5 minutes. Uncover, flip over and grill an additional 3 minutes. 5 of 5 Divide pineapple rings among 4 plates. Top each with 3 pepper pieces (one of each color) and a fillet. Drizzle pineapple glaze over beef and serve. Per Serving: 36 g carb., 6 g sat. fat, 51 g pro., 4 g fiber, 690 mg sodium, 17 g Fat, total, 499 kcal cal., 134 mg chol.